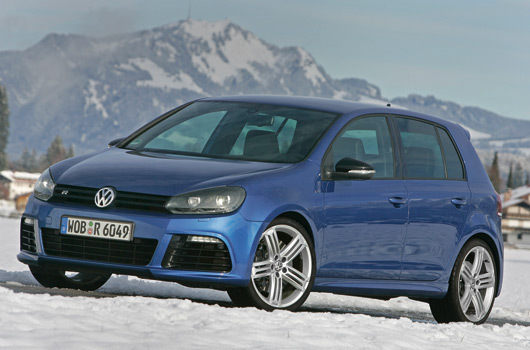 We know the Golf R is coming to Australia, and we know it should be hear by the middle of 2010. What we don’t know is how much customers should expect to pay for what is essentially an Audi S3 in Volkswagen clothing. Signs from the UK are not good, with the Golf R costing around £2000 more than the S3. So we can expect some very sharp pricing for the Golf R, then. Happy days. The outgoing R32 had a starting list price of $57,990. Entry level pricing (including GST and LCT) for the Audi S3 is $66,500. While Gehling states the Golf R will hit the market priced between the old R32 and the current GTI (around $40K, depending on configuration) one would assume the final price will be much closer to the R32 than the GTI. Still, even at a starting price of $57,990 the Golf R represents cracking value. Also revealed by Gehling was a sneak preview of the Golf R’s local specification. In order to keep Golf R pricing so sharp items such as leather sports seats, Adaptive Chassis Control, 19” alloys (shown in the image above) and more will remain on the options list. Ah, so the R32 standard leather becomes an option at $2499 and the car starts $1500 below the old R32, wink, wink. Yep, that sounds about right to me. Will be interesting to see if xenons are standard, too. Crucially, it looks like the car can be bought for a few K less than the S3, which you’d reckon is a necessity in our market. Close to $70k on road I guess? Very smart move on behalf of VW in my view – I’d hapily forego leather for other tasty options to keep the price down. Also VW has just dropped prices on Trendline and Comfortline Golfs – no reduction on GTI though except for metallic paint. I just read and article stating the golf r will drop 11KW from 199 to 188KW due to the hot conditions in AUS. Until that announcement the Golf R was on my shopping list. With the reduced power I have scratched it and may as well chip my GTI instead. It’s been highlighted that the carsales article says leather “sports” seats which may refer to the race style recaros available on the R32 and S3. That could mean regular leather seats, as can be optioned in the GTI, might still make the cut as standard equipment. I’m with revhead. This is good news. A lower base price + more on the options list suits me fine. Makes sense it’s cheaper than the R32 as it uses a generic engine… S3/roccoR/golf R what next? that press pic makes it look very very bland. S3 trumps it by a long shot. Im surprised no one has noticed. But the wheels you see on every single press photo, are the 19″ rims, which are going to be OPTIONAL in Australia. We are going to be getting the 18″ Rims as standard, not the 19″. So sure it might cost less. But they are taking equipment out of the car, that used to be standard. When have 19″ alloys, nav, ACC or park assist ever been standard equipment on any Golf sold in Australia? Thats the thing. Why reduce the price? why not keep it the same, and make these things standard equipment? Paul, because some of us aren’t interested in leather, 19s, park assist etc! Guys I am pretty sure Leather and Xenon will be standard. Most of the references to leather being optional have referred to Sport Leather – ie the Recaro’s. I may be wrong of course, but I cant imagine leather not being standard. It would defeat the purpose of going on about and making a point of saying its going to be cheaper than the R32. Cause if leather is standard, its not going to be ‘cheaper’ at all to make it to the same spec as a base entry R32. Lets just wait and see. For me though, i’ve got an almost full optioned GTI on order due April (only options missing are ACC and Dynaudio). I am however planning on letting that go to someone else (with no wait time) and taking a lesser spec R. This is assuming Leather and Xenon are standard and one of the first boats arriving bring in an R DSG 5dr with Sunroof and MDI fitted. I’d rather spend $65k on this R with less options than a $57k GTI with most options. Surely the drop in power from 199 to 188kW due to Australia’s hot conditions is just a marketing ploy to try not to cannibalise S3 sales so much. If the S3 and R have the same engine then why do they need to drop the power in the R? @spacedude, yeah, chip the Golf R and you’ve got approx 235kW and AWD let’s you use that power from standstill. @slith – Australian delivered S3s have also been detuned to 188kW/330Nm. So both Golf R and S3, in Australia, will have the same power according to the spec sheets.